Effective April 1, 2019, a 5% sales commission will be instituted year round on all non- consignment sales. Mark and I fought against this change as long as possible. But, it is clear year round sales commission is necessary due to the rising cost of doing business in VT and at the Quechee Gorge Village. NOTE: This 2nd notice serves as more than the 30 day notice required of any change impacting dealers at the Vermont Antique Mall. We thank you for your understanding. We've received numerous complaints regarding the Check Your Sales Site. Antiquesoft has been periodically working on an upgrade which is causing these intermittent, short outages. They predict their work will be completed tomorrow and all will return to normal. Thank you for your patience. Dealer payout checks for 7-16 to 7-31 pay period will be available tomorrow 8-3-18. 6.1 to 6.15 checks are ready for pick-up at the front desk. Thank you. In discussion with other Antique Malls around the country Mark and I learned it is a common practice to offer store credit towards rent for working in the store. We love the idea and hope you do too. We are going to give it a try! Question: When will it start, and how will it work? Answer: We plan to start the program July 1, 2018. If interested, call or stop by the front desk to add your name to the list of Dealers wanting to be called when we have available hours. Note: There will be a memo of understanding to sign regarding the program. Question: What will be the value of my hours worked? Answer: Each hour worked will earn a $10 credit toward your rent, never to exceed your monthly rent payment. Question: What type of work will I be doing? Answer: Duties will vary but the focus will be helping our customer have a wonderful shopping experience and helping keep the store clean. There will be no Point of Sale duties. Question: Will I be allowed to work on my booth during this time? Answer: No personal booth work allowed during the hours you are earning store credit. Working together will make the program a success! Update Door Bell is working! Dealer sales for Monday and Tuesday have been posted. Please note the date reflected for these sales is today May 24, 2018. Thank you for your understanding. We are looking forward to a great holiday week-end! Thank you from the VAM team. Dealer Sales Site is available. Sales from May 21st and 22nd will be updated soon. Thank you for your patience. Unfortunately, the Dealer Sales site went down yesterday at approx. 11:30AM. IT was engaged immediately and has been actively working the issue. The site should be up and active tomorrow however, there could be a delay in sales reporting from the 21st through time of repair. Please accept my apologies for the inconvenience. Check this site for updates. Our apologies for the continued inconvenience the sales site is actively being worked. We will post when site is up and available. Dealer Checks Available for 5.1.18 to 5.15.18 for pick up, please inquire at the front desk. The Dealer Sales Website is unavailable. The estimated time of availability for this site is tomorrow by noon. We apologize for the inconvenience and thank you for your patience. 2.1 to 2.15.18 payout checks will be available in the shop on Tues. 2.20.18. If not picked up checks will be mailed on Mon. 2.26.18 not 3.1.18. Checks will be available for pick up on 1.18.18. 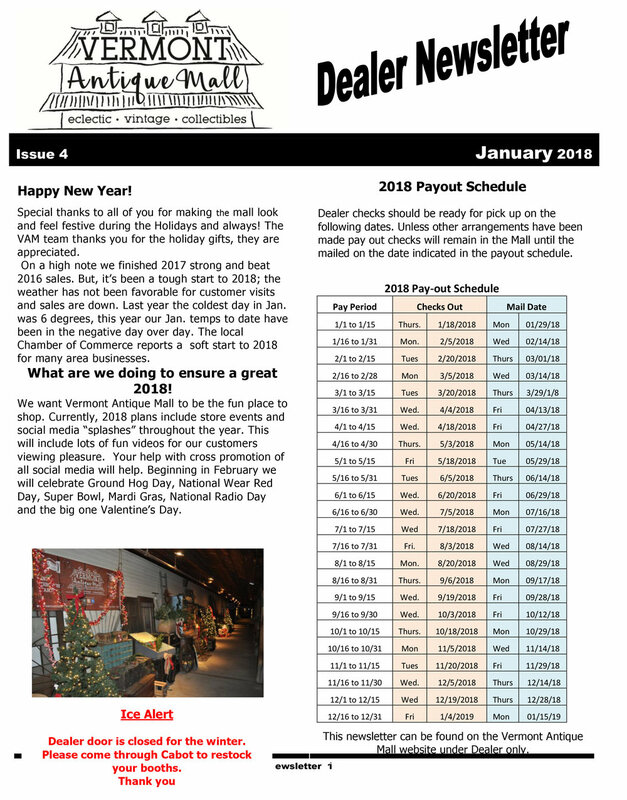 Please read newsletter for future check production, pick up and mail dates!